DUBUQUE — As Cardinal Timothy Dolan entered the room at Loras College in which he was to speak on the afternoon of April 20, he slowly made his way through the rows of students and other members of the campus community who had gathered to hear him — pausing at each person to introduce himself and to offer a warm smile and a strong handshake in his route to the podium. During the hour that followed, Cardinal Dolan — the archbishop of New York and one of the most prominent figures in the Catholic Church in America today — spoke to a select audience that included seminarians in the St. Pius X Seminary program, a cohort of Loras students known as the John Paul II scholars, members of the “Philosophy of God” religion course, and the college’s FOCUS (Fellowship of Catholic University Students) missionaries. Introducing Cardinal Dolan was John Saeman, a 1958 Loras graduate and former regent of the college who is also a personal friend of the cardinal’s. In his presentation, Cardinal Dolan spoke about one of his predecessors, Cardinal John O’Connor, who was the archbishop of New York from 1984-2000. He said Cardinal O’Connor had believed that his role as archbishop was to help Christ save souls. Cardinal Dolan said that Catholic colleges and universities have a similar function. 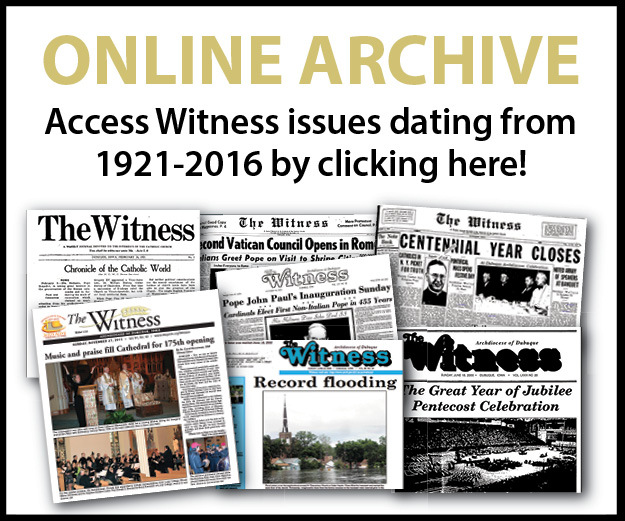 “You think about what goes on on this campus — literature, science, history, philosophy, theology, business, music, athletics, psychology, you name it, all the disciplines — everything that goes on on this campus is all part of the glory of God and the human person fully alive,” reflected the cardinal. There is a caricature, he said, of the Catholic Church in the world today, that it’s oppressive, anti-intellectual, that it wants to curtail freedom, but he argued that just the opposite is the case, that the church actually encourages humanity to seek truth. He said it also is important for Catholics today to offer others a spirit of hope and joy. At the end of his presentation, Cardinal Dolan fielded several questions from the audience. 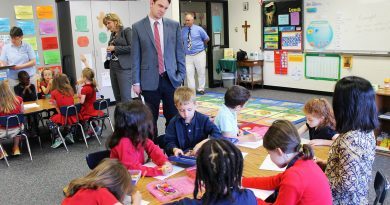 One student asked what he missed most about being a parish priest and what he liked best about being a cardinal. “There are things I love about being a cardinal. I get to dress up like this,” Cardinal Dolan said with a good-natured laugh, as he pointed to his scarlet and black clerical attire. He said being a cardinal also gives him a chance to accept invitations to speak at colleges and seminaries and other places outside of his diocese, which he enjoys. Cardinal Dolan, a Missouri native, was named the archbishop of New York by Pope Benedict XVI in 2009 and was appointed to the College of Cardinals in 2012. 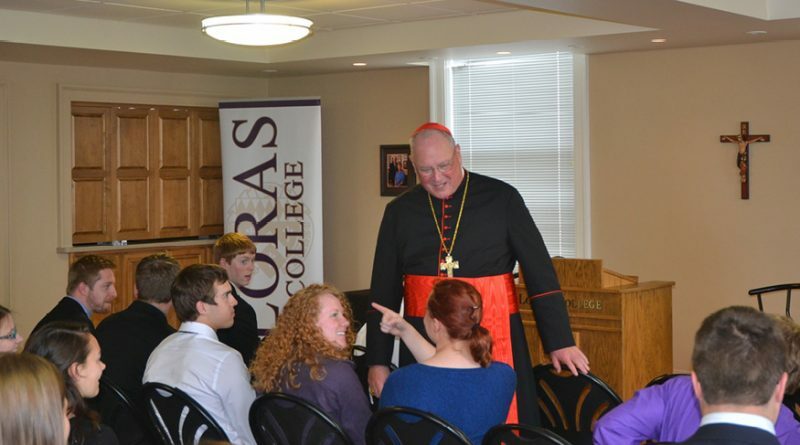 Jen Andrysczyk, a senior theology and philosophy major at Loras, had the opportunity to sit in on Cardinal Dolan’s presentation and said she enjoyed hearing what he had to say. 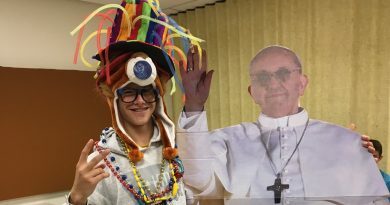 Freshman Jacob Francois, a seminarian whose home parish is St. Patrick’s in Cedar Rapids, said Cardinal Dolan’s visit to Loras was the second time he’s gotten the chance to see the cardinal in person, but he was no less impressed by the experience. 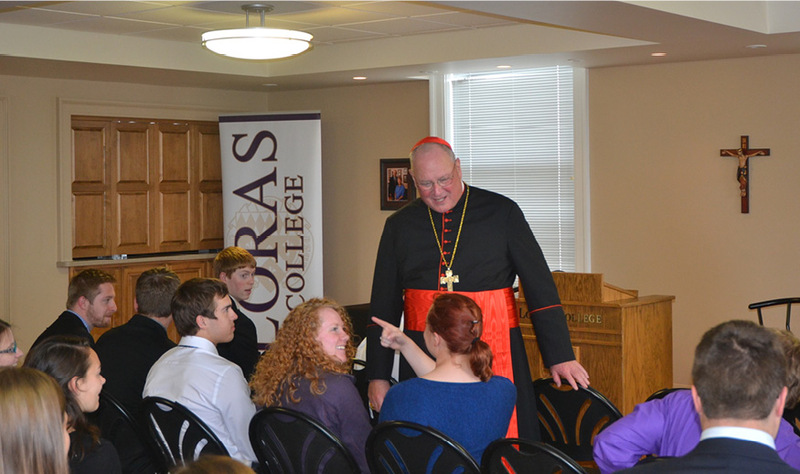 Earlier in the day, Cardinal Dolan had lunch with a group of Loras faculty, and following his afternoon presentation, celebrated Mass at Christ the King Chapel, and later spoke at a campus dinner where he addressed the impact of Bishop Mathias Loras, the college’s namesake and the first bishop of Dubuque, on the 19th-century American Catholic Church.